The late American art critic Bernard Berenson was widely regarded as one of the most authoritative experts on the Old Masters, that rather pompously-named group of European artists who had their respective heydays before the turn of the 19th century. He passed away in 1959, but not before creating a vast body of work regarding his chosen passion, the correct attribution of artworks. There is some controversy over his accuracy, or at least his motives, in this field, but we'll leave that for another post. Fast-forward to present day, where a new Berenson has taken up the mantle of art criticism - or at least, taken up its bowler hat. Throughout the halls of the Musée du quai Branly in Paris a behatted robot strolls, examining the artwork, and formulating 'opinions' about them. Brainchild of robotics engineer Philippe Gaussier and anthropologist Denis Vidal, Berenson is a reactive system that uses its understanding of other's emotions as a gauge for forming his own opinions. It (or should we say he?) watches the reactions of fellow museum visitors and sorts them into positive or negative, and then blends these reactions to decide whether or not it likes a certain piece. "When he likes something, he goes in this direction and smiles. When he does not like, he goes away and he frowns – that's how it works. Basically, the idea is by doing so, it adapts itself to its environment, on the basis of this artificial taste, and the aim is to develop a robot that's the equivalent of aesthetic exploration of the world and to see if because of that it may adapt itself more easily to the world around and make other things on this basis," Vidal explains. "So he developed his own knowledge of the world, which no other robot will have. So if you put different [versions] of them, they will have different ways of exploring the world. So what we are doing now is we develop different robots with different tastes, artificial tastes, and we try to see if because of that they may explore the world around them in more interesting ways." Curiously enough, it seems like naming the robot after the deceased critic is a token of respect, but Berenson the man may very well have derided his robotic doppelganger as a piece of new media trash, as far removed from the business of actual art criticism as it is possible to be. 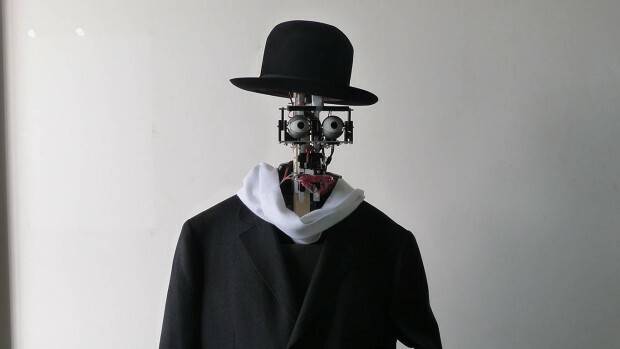 Unfortunately for the man, the robot is here now, and rather dashing in his bowler hat.